Happy New Year! We hope you had wonderful holidays with family and friends, and we wish you an amazing 2013. It's time to get back to those projects that may have been put on the back burner for a few weeks. We've got lots of classes, including three new ones by Rami Kim, and fabrics to inspire you. Susan Berbec sends a very big Thank You to everyone who donated quilts for the victims of the East Cost storms. Susan shipped a total of 153 pounds of quilts and blankets, thanks to your generous donations! 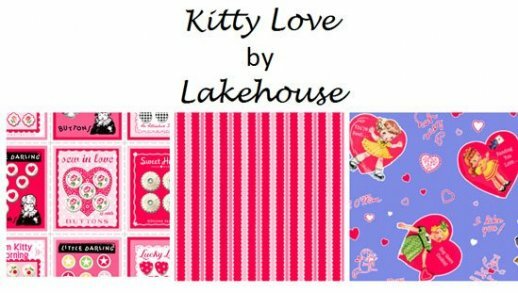 We've just put out some wonderful Valentine fabrics, including the two featured below. We also have Love Letters by Stof, a very romantic collection featuring roses and vintage postcards. 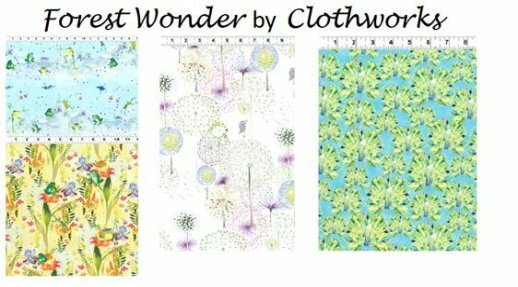 In addition, we have a new Stonehenge collection from Northcott and Forest Wonder by Clothworks. 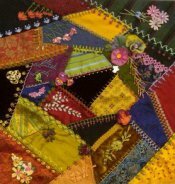 Crazy Quilt Group, Mon, Jan 7, 10:30 a.m. - 1:30 p.m. Sit & Sew, Thu, Jan 10, 1:00 - 5:00 p.m.
Chameleon Bag, Perky Brouilette, Sat-Sun, Jan 5-6, 10:00 a.m. – 4:00 p.m., $55, supply list. Perky is the designer of this beautiful bag. It's a great size, has lots of pockets, and a strap that easily converts the purse from a shoulder bag to a cross-body bag! 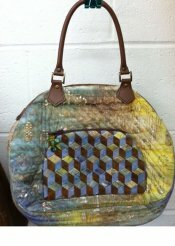 Plus, it features an outside reversible pocket wrap that is removable, so you get three purses in one! This class is in 3 weeks. Start the year off right with a new purse...or rather, 3 new purses! 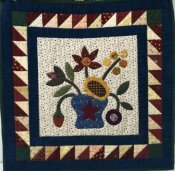 Needle-turn Applique, Judy Cummings, Sat, Feb 2 & Feb 23, 9:00 a.m. - noon, $25 (includes pattern), supply list. Make a charming wall hanging and learn the basics of needle-turn applique, including curves and points. 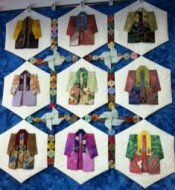 Beginning Crazy Quilting, Toni Jordan, Sun, Feb 3, 11:00 a.m. - 3:00 p.m.; Sun, Feb 10 & 17, Noon - 2:00 p.m. 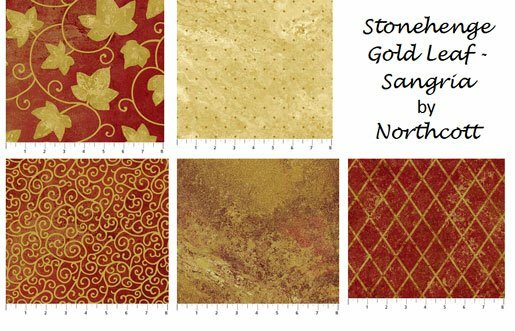 In the first session you’ll construct a 14” block using a wide variety of fabrics; cottons, silks, tapestries, velvets, linens… In the second session you will start the embellishments. You will learn a variety of embroidery stitches using different threads and techniques. In the third session, you will learn more embroidery stitches and embellishment techniques using buttons, laces, jewelry and other “finds”. 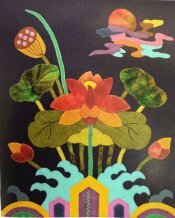 Lotus Blossom Wool Wall Hanging, Rami Kim, Thu, Feb 7, 10:00 a.m. – 3:00 p.m., $48, plus supplies. Designs such as sun, mountain, water, rock, and cloud represent longevity in Asia because these objects exist eternally in nature. Lotus blossoms symbolize spiritual purity and freedom from the worries of a secular world. In this wool quilt with pennies all these elements are harmonized through Asian-influenced colors. Perfect for recycling your old wool jacket or skirt for the background. 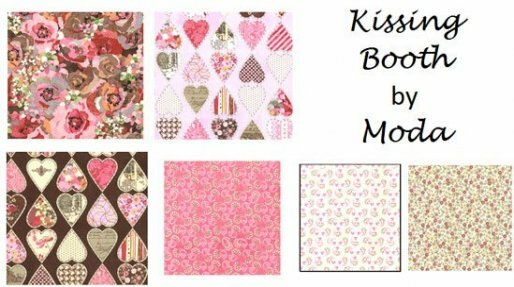 This could be easily expanded into a three-panel quilt wall hanging.